Vivekananda Kendra Chinchwad Branch had organized an Inter School Patriotic song Competition for schools here in the city of Pimpri Chinchwad. Around 65 schools particapated in this event. We had received tremendous and huge response as the hall was packed with students and teachers. 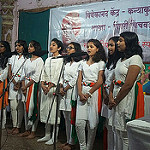 All the songs chosen by the schools were superb and really instilling the spirit of patriotism in us. The whole atmosphere had become magical with the shouting of slogans " Koun Chale bhai Kaun Chale - Swamiji ke Veer Chale", "Bharat Mata ki Jai", "Kashmir se Kanyakumari - Bharat Mata Ek Hamari" etc. we have urged all the schools to definitely enrol for our Pariksha de Hanste Hanste Shibir especially for the students of Std. IX and X.